Lauren & Sean contacted me looking for classic, timeless photos that captured the beautiful DC architecture and candid emotion on their wedding day. While they were drawn to black and white images, they also enjoyed creative shots with vibrant pops of color, too. I gave them a nice eclectic mix, but I think you will notice that the elegance and sophistication are key players in their wedding photography collection. The photo above shows the architecture, their classic attire and venue as well as a bright blue sky! 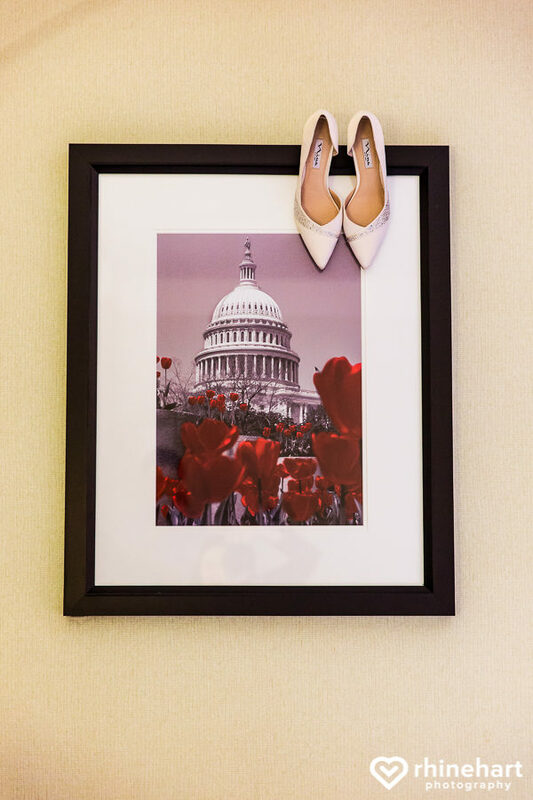 Washington DC is where Lauren & Sean met, fell in love and where they now live and work. Sean works for a North Carolina Congressman on Capitol Hill, so incorporating the Capitol building into their wedding photography was exactly what I wanted to do if it was possible. I just wasn’t sure how I would be able to make it happen. Lauren’s suite was a flurry of activity as family and friends gathered for wedding day preparations. Here Lauren takes a moment to breathe while her make-up artist prepares her brush. I love capturing candid moments like this one. I like the editorial feel of it and the way it tells a story and captures some of the emotion and activities of the day. Sean mentioned appreciating Lauren’s adventurous spirit that pulls him out of his shell, her ability to encourage him when he is down. He also loves how quick she is to laugh. He also mentioned that she cares deeply about others and often puts the needs of others before her own. She is grounded and never looses sight of what is important in life. Lauren’s man of honor, Jeremy, was amazing. Here he is carrying her train during her bridal portraits. They are cracking up as a passersby congratulates them and wishes them many years of wedding bliss ;). Meanwhile Sean and the groomsmen finished last minute preparations. I like the energy in this photo. The black and white really draws your attention to the high contrast tuxedos that the men are wearing. I love how they are all busy here. Lauren appreciates Sean’s sense of integrity and honesty, the way he treats others with kindness and respect, how he is loyal and loving. Lauren & Sean used the spiral staircase inside of the Carnegie Institution for Science for their first look. I used a variety of compositions throughout the first look, but love this first shot. I really love the leading lines, symmetry, simplicity and balance of this next photograph. While I spend most of the wedding day capturing candid moments, we do take some time for more traditional wedding portraits as well. Lauren & Sean both have fantastic senses of humor and were making each other laugh all afternoon. Lauren & Sean both shared that what they are most excited for is their future together. They look forward to growing the love that they have for each other, raising a family someday and being best friends throughout their lives. Sisters– here are the sweet flower girls! Lauren & Sean live near Logan Circle and first noticed the Carnegie on their walks downtown. The exterior of the building is breathtaking and they always wondered what it looked like from the inside. It was naturally the first venue on their list as soon as Sean popped the question :). One of their favorite features was the rotunda and the way that they would be able to have a ceremony in the round and be so close to all of their family and friends. One of their favorite moments from their wedding day was exchanging their own vows. They were personal, genuine and sincere. They even laughed aloud at points. The ceremony was incredibly honest and joyful. I liked the way the light was streaming in through the window above the entryway rim-lighting the happy couple. The ceremony was very personal and officiated by Rev. Jeff Maszal. Cocktail hour began with more music by Olivera Music and hors devours by the extremely talented staff at Purple Onion. The guitarist played Bossa Nova music in honor of Lauren’s Brazilian heritage. While some of the wedding guests enjoyed the Brazillian serenade inside of the Carnegie, many enjoyed the outdoor space as well. The portico was a real draw for Lauren and Sean as well. Here you can see Lauren’s mother walking out on the portico. The flow was kept moving smoothly by day of coordinator, JEM Events. Inside the Carnegie ballroom was decorated in ivory, gold and shades of pink. Here you can see the table decor and draperies, too. A highlight of the evening was Lauren’s father’s speech. He had a natural ability to draw the guests in with his laughter and poignancy. Growing up, his family joked that he could be the mayor of their small town because he was so friendly and always had a story to tell. His speech shared about moments in his life and how they connected and lead to this one moment of him giving his daughter away and gaining a son. He had the entire room laughing out loud and crying, even the bride and groom! During the wedding cake cutting, Lauren’s Uncle Jimmy sang “Fly Me to the Moon” by Frank Sinatra. It was a very fun, impromptu moment! Speaking of dancing– Lauren & Sean’s first dance was pretty amazing. I stood outside of the door to try to show off all of the detailed architecture and the dancing and crowd surrounding the couple. I wanted to capture the feeling that all of those combined elements created for the moment. A different perspective now, rather than capturing the full scene, this time you will see just one moment. A little luck and anticipation– here is Lauren and Sean’s final dip during their first dance. Then the dance floor was open to all of the wedding guests and kept full by DJ Mark Maszal. Lauren & Sean took a few moments alone to themselves. Sean picked her up, it was very sweet. Lauren & Sean thank you for your very kind note– I really appreciated hearing that you felt like Kris and I were both incredibly professional and so discrete that you completely forgot that you were being constantly photographed ;). Hopefully you will see these photos and re-live the incredible moments of your wedding for years to come! I wish you two both the very best!! !